Our specialties are investigating and designing the repair of structures damaged by expansive soils like Yazoo clay and the engineering design of structures in an expansive soil environment. We have designed repairs that include re-leveling multistory buildings and foundation replacement for commercial buildings up to 50,000 square feet. 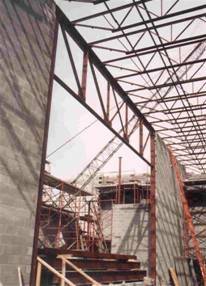 We also design framing systems and foundations for commercial buildings, churches, and residences including additions. Locally, additions are challenging because often the original structure may have foundation movements that must be understood before the foundation for the addition can be designed. In Central Mississippi there are two primary foundation systems that work well. These are floating slab-on-grade foundations and drilled pier foundations with a properly designed void system. Each type of foundation has limits of effectiveness so foundations need to be customized for the site and geological conditions. Detailed studies we have made of existing foundation failures have been used to contribute to the general understanding of expansive soils. Central Mississippi has the Eocene Yazoo clay Formation that is one of the most active expansive clays in the world. In addition this clay in Mississippi has a more recent alluvial deposit above it that creates perched water tables that feed water to the expansive clays below. The geology of these surface deposits are complex and can change considerably over short distances. This adds difficultly to the design of the foundation system. The key starting with the right kind of soil survey and planning the project. We encourage Architects and Owners to discuss construction planning issues with us.